Nextera offers WiMax wireless broadband technology that is designed to deliver converged high-speed voice and data services up to 6Mbs. Utilizing point to multi-point WiMax, Nextera has created distinctive business classes of service that prioritizes the voice traffic to provide a quality, robust and resilient connection for even the most time-sensitive of applications. WiMax is built on WLAN and IP-based connectivity with Quality of Service and Service Level Agreement capabilities, making WiMax an ideal access network for your next-generation voice and data services. Nextera’s Traditional point to multi-point wireless service is perfect for wireless internet bandwidth where a converged voice or data is not needed. Nextera’s traditional wireless does not have QoS or SLA included as part of the service offering. Voice services are available where WiMax is deployed and is not available with traditional wireless services. Nextera uses a variety of technologies as part of its wireless network including WiMax, traditional wireless service and point to point microwave. QoS and SLA are only available for WiMax and Point to Point Microwave services and does not apply to Nextera's traditional wireless service. Wireless service can be configured with dedicated internet or as a point-to-point private network. Both configurations include an Ethernet interface to optimize customer interface and requires no additional customer equipment to purchase. Simply plug into your LAN or router. Performance Guarantee: Nextera guarantees network performance in writing with an industry-leading Service Level Guarantee including network availability of 99.99% as measured on an annual basis, network latency of less than 60ms and packet loss of less than 1% as measured on Nextera’s backbone network. Symmetrical or Asymmetrical Bandwidth: Internet connections can be configured as symmetrical or asymmetrical connections with guaranteed bandwidth speeds. Symmetrical connections (bi-directional/duplex) provide equal capacity for both uploads and downloads for critical business applications. Professional Installation: Nextera’s standard installation includes antenna and radios, non-penetrating sled or J-bar antenna mount, up to 250 feet of standard cable weather-sealed and run from the antenna to the customer demarcation with ethernet interface, service turn-up and testing. Email Addresses: 10 Email addresses included with service, additional email addresses available on request. Technical Support: Nextera provides 24/7 network monitoring and technical support along with locally-based customer service. Satisfaction Guarantee: Nextera provides a 60 Day Satisfaction Guarantee with all service offerings. Network Performance: Nextera provides business class performance with the reliability businesses demand all backed by a industry leading SLA (Service Level Agreement). Rapid Installation: Whereas wired service providers can take weeks – even months – to provision a connection for a new customer, Nextera can have customers activated in a much shorter timeframe. High Bandwidth: Speeds range from 1Mbs to 1Gbs depending on network design. Expansive Coverage Area: Wireless service reaches areas where fiber or wired high bandwidth services are not available like remote satellite offices or temporary buildings lacking terrestrial connectivity. Redundancy / Business Continuity: Nextera’s network offers a truly diverse path, unaffected by the vulnerabilities of traditional networks such as cable or fiber cuts that can take days to repair. Customers can configure the wireless connection as a their secondary path, which automatically “fails over” the customers’ service to this backup circuit to provide even greater protection against downtime. 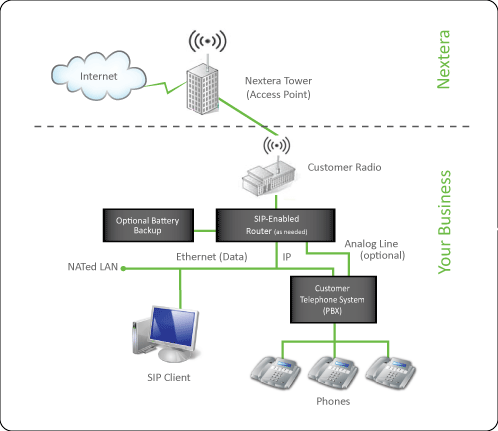 Ethernet Connectivity: Nextera data service is delivered via an Ethernet connection, making it easy and simple for customers to connect directly to their LAN. Private Networks: Utilizing Nextera’s extensive metro network, we are able to provide connectivity to one or more locations with Dedicated Internet Access and Private Network Ethernet Connectivity, or a combination of both with Point-to-Point technology. Receive 1.5Mbps to 100Mbps or higher. Single / Local Provider: Nextera can provide all your voice, data and internet needs as your single source provider on one bill with locally based technical support and customer service. BGP / Multi-Homing: BGP / Multi-Homing configurations allow redundant internet connectivity. With BGP, Nextera provides one of your two Internet feeds, which is called multi-homing. When you multi-home your network to two different ISPs, BGP runs on your router(s) and provides redundancy and network prioritization by selecting which ISP offers the best path to resources. Scalable Bandwidth: Configure your wireless connection to be scalable on demand, it’s as easy as “turning up the dial,” and Nextera typically can make it happen in a matter of hours. Such bandwidth increases are perfect for growing companies, special events, meetings, conferences, short term projects or for business continuity and disaster recovery purposes. Website and Domain Hosting: Packages are available to suit the needs of any business with three packages to choose from. All sites are hosted in our secure, monitored data center. Bandwidth Monitoring: Web portal access is available for customers to monitor bandwidth historically and real-time to determine network needs. IP Addresses: Additional IP addresses may be added as required. Email Addresses: Additional email addresses may be added as required.